The beast is here. 60 CAD$ for a frame, not so bad. Finding the good donor was not easy here in Canada, not too much oportunity. The rear before the cleanup, my plan for the rear axel doesn't use the existing part, nor the old motor position. All clean. Ready to receive the new axel mount a parts. 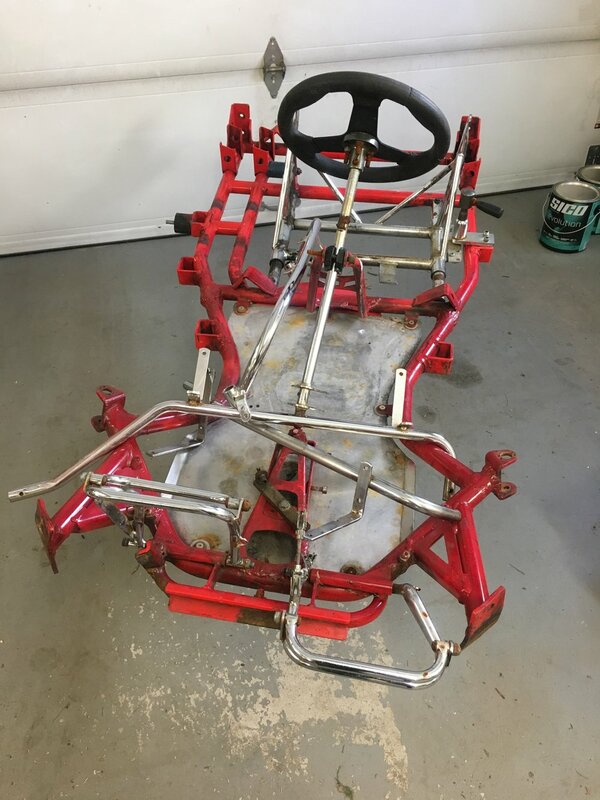 It's time to clean the middle part and seat assembly. To complex, and not centered because of the old gas engine mount on the side. Next is the steering wheel assembly, cleanup, update, and of course it need to be centered as well. All done, with new mount for the seat (not complete) and temporary welded. So clean !, with a new front bumper. Cut of stuff is finished, time to start cleaning the paint and doing some assembly. Motor is here, 10kw golden motor air cooled. Perfect fit, Waiting for other parts to fabricate a mounting bracket for it. Seat is here, with foam padding for my old back. And used wheels and rims too. Black scheme. Motor controller with a cheap accelerator that will do until i find a better solution. More parts are here. From left to right, my wheel mounting support, the sprocket for the motor, mounting parts for the seat, The new wheel (the old one was hurting my hands, so suede it is). And my ampere meter and voltmeter to follow up the battery simulation, huge shunt for all thoses amps. More parts, my read wheel hub, front wheel spindle with front wheel hub, main sprocket, Mounting collet, the mounting with the freewheel for the rear axcel. On top the rear axcel, and my brake system (notice i'm missing my brake discs in my delivery >< stay tuned). Everything fit perfectly. V1 of my electronic board. (it already doesn't look like this anymore). So an ESP32 dual core at 80 mhz, with flash memory (i will not use the wifi ou bt for the instant). An oled screen, 128x64 pixels. A GPS module. and a rotating encoder with switch for input. So all this will control my speed, stats, gmeter, and my profile for accelerator and brakes (engine brake) i will not plug directly the analog accelerator to the motor controller (and i will add an analog brake for the motor, Instead the electronics will read that. and compute a real output according to calibration and selected mode. That way i can change the way the kart accelerate or brakes during a race. More picture when the prototype board will be completely finish and the software i'm making for it also. Thing are getting serious. Top left accelerometer and magnetometer to give me the G force, and a compas (for fun) brown square, gps to give me my speed (the orientation is given by the magnetometer, because gps are bad for that if you don't move or move slowly). of course on the right my esp32. bottom is my voltmeter and ammeter .